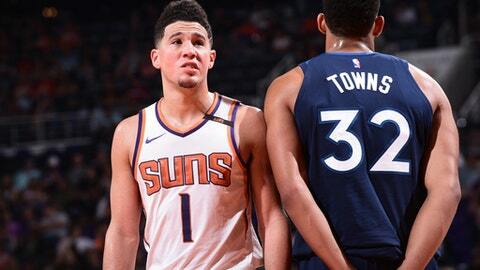 PHOENIX (AP) Devin Booker and T.J. Warren scored 35 points apiece and the Phoenix Suns snapped a five-game losing streak by beating the Minnesota Timberwolves 118-110 on Saturday night. Booker scored nine in the Suns’ decisive 21-7 run over the final 3:50. Andrew Wiggins scored 27 points and Jimmy Butler had 25 in Minnesota’s second straight loss after a five-game winning streak. In a back-and-forth second half, Phoenix took control with a late 14-0 burst. Booker scored seven points in the streak and capped the outburst with a pass to Marquese Chriss, who sank a 3-pointer from the corner to give the Suns a 111-103 lead with 51.2 seconds to go. Chriss was the only other Phoenix scorer in double figures with 13 and blocked five shots. A 19-4 run to end the third quarter and start the fourth gave the Timberwolves a 94-87 lead on Shabazz Muhammad’s basket with 9:47 to play. But the Suns scored the next 10 to go up 97-94 after Warren’s 17-footer with 6:53 left. Minnesota responded with a 9-0 spurt and Jeff Teague’s 3-pointer put the Timberwolves up 103-97 with 4:46 to go. Minnesota went four minutes before its next score. Neither team had a double-digit lead all night with the Timberwolves, who never trailed in the first half, up 60-57 at the break. Chriss sank a 3-pointer in the opening minutes of the second half to tie it at 61 and, after Chriss’ block of Karl Anthony-Townes’ shot led to Warren’s breakaway dunk, Phoenix led 83-75 with 4:06 to play in the third. Minnesota called a timeout, then went on a 13-2 run to end the quarter to lead 88-85 entering the fourth. Anthony-Towns and Booker are friends and former teammates at Kentucky. They also are the top two scorers out of the 2010 draft. It’s one of four draft classes in NBA history where the top two scorers were college teammates. Towns had 17 points and 12 rebounds on Saturday. Timberwolves: Minnesota hadn’t played since a loss at Golden State on Wednesday while Phoenix was playing on back-to-back nights. … The Timberwolves swept the three-game series with Phoenix last season. … Minnesota lost despite a 19-7 advantage on the offensive boards. Suns: Tyson Chandler played after missing the previous two games with back spasms. … Phoenix improved to 1-3 on a season-long six-game homestand. … Tyler Ulis started at point guard for first time this season, replacing Mike James.